Alums Begin Pursuit of Cup - College Hockey, Inc.
More than 100 former college players are in the race for the Stanley Cup. 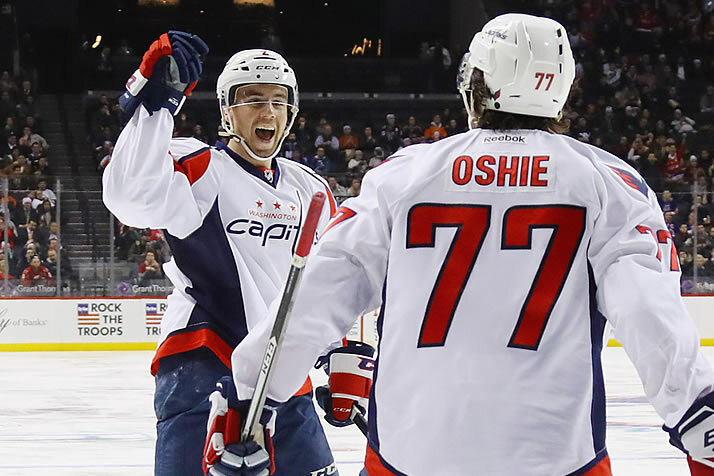 Matt Niskanen (Minnesota Duluth) and T.J. Oshie (North Dakota) are two of eight former college players on the defending Stanley Cup champion Washington Capitals. College hockey is well represented in the Stanley Cup Playoffs, with 116 former NCAA players on rosters as the chase for the Stanley Cup begins Wednesday night. To celebrate the playoffs, College Hockey Inc. has partnered with the NHL for the College Hockey Inc. Bracket Challenge. Fans can pick the winners of each series in the Stanley Cup Playoffs, with the top bracket winning College Hockey Inc. gear from CCM Hockey, including a sweatshirt, shirt and hat. Every first-round series will feature between nine and 19 NCAA alumni. Boston and Pittsburgh lead all playoff teams with 13 former college players on each roster. Eleven of the 16 teams in the playoffs have a former NCAA champion on their roster, including 2018 Frozen Four Most Outstanding Player Karson Kuhlman on the Bruins. Two series will pit former college teammates against each other: St. Louis-Winnipeg (Michigan State’s Mackenzie MacEachern and Mason Appleton) and Boston-Toronto (Denver’s Danton Heinen and Trevor Moore). Thirty-five schools have alumni in the Stanley Cup Playoffs, led by Michigan (12), Minnesota (10), Boston College (9) and Boston University (9). A record 325 NCAA alumni appeared in the NHL in the regular season, making up 32.5% of all NHL players.